Casa Med Low Profiling Bed Finished In Beech Effect. 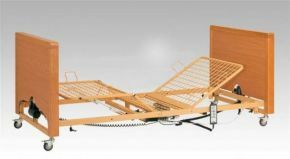 The Casa Med Low Profiling model is one of our best adjustable beds, with four supporting sections, excellent positioning ability, and visually pleasant beech finish. It's an excellent choice for those who suffer from fluid build-up, and of course an adjustable configuration can also help prevent pressure sores and other problems associated with lying down for long periods. Making the change to an adjustable bed can mean better health and better comfort as well. Although this bed sits quite low down, the height can be adjusted as well. The Casa Profiling bed series are all well designed and well constructed with a safe, easy rest in mind.